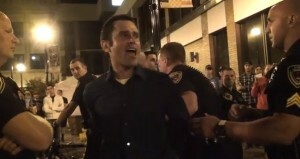 SPRINGFIELD — Three Christians with a church in Springfield, Missouri were arrested on Friday night while preaching the Gospel in the public square. The situation is part of an ongoing battle between members of Lighthouse Anabaptist Church and the Springfield Police Department. Brummitt, who was moved by God to reach his country while serving in Afghanistan, has received nine tickets from the Springfield police just this year. However, Brummitt has repeatedly explained to police that the city has affirmed that his activities are permissible under the law. In an email from Chris Straw, the director of Building Development Services, it was explained that “a formal permit is not required” for the church’s evangelistic activities, and that “all sound generating devices shall not exceed 75 decibels.” Brummitt said that he has followed the law and has done nothing wrong. “We try to be reasonable,” he stated. However, the city states that the reason the pastor is being ticketed is because members of the community are lodging complaints. This past Friday, the ongoing tension between Lighthouse Anabaptist Church and the Springfield Police Department escalated when several officers seized the church’s equipment and put the three of its members in handcuffs. Brumitt states that the group had been preaching outside of a concert in Park Central Square when an officer told the Christians to move elsewhere. Brummitt asked to see where the law prohibited them from preaching in the square. But what happened next was completely unexpected. “The officers jumped out and grabbed our equipment … and started taking it,” Brummitt recalled. At this point, Brummitt and a friend began to grasp the equipment as they believed that their private property could not be legally seized without a warrant. They were immediately put in handcuffs. A woman from the church named Erica, who had been holding a sign during the outreach, then reached out for the video camera. Police began prying her hands away, and minutes later, she was also placed under arrest. “We are taking this for evidence!” the officer declared. “I’m not doing anything wrong!” the woman contended. All three were placed into the back of a police van and where transported to the the local jail, where they were fingerprinted and had iris scans and mugshots taken. “It was a very degrading sort of event,” Brummitt recalled. However, he also remembered that when police arrived at the jail, they were surprised at what they saw. “As they opened the door [to the van], they were kind of shocked to find three people singing hymns,” Brummitt recalled. The pastor and his two congregants were released later that night, and were charged with obstruction for attempting to stop the police from confiscating their equipment. “There could be a huge suit now because of the arrest,” Brummitt stated, advising that it becomes a class b felony in the state of Missouri to intentionally violate a person’s constitutional rights on the third offense. The church has retained Alliance Defending Freedom (ADF) for their legal counsel.